The Swann FreeStyle HD 1080p Action Camera joins other high quality video cameras geared for outdoor, rugged use with it’s compact, sturdy design. 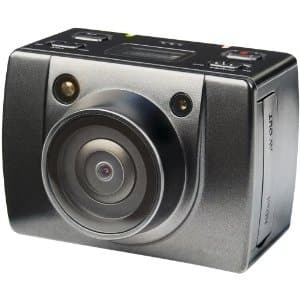 It boasts 8MP still images (with continuous shot feature and self-timer) and High Definition 1080p video (with 30fps, 3x digital zoom & stereo audio), which can last up to 10 hours of recording time stored to a Micro SD card of up to 32GB (not included). It is powered by a removable Lithium ion battery that offers two and a half hours of recording time for each charge. Add that to the included water-proof case that can handle 65ft/25m depth, it’s a great little package. 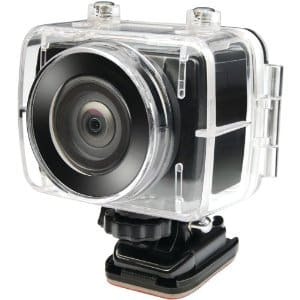 The Swann Freestyle is directly marketed to be a budget-friendly alternative for the GoPro, with its HD video, waterproof casing and long life battery. But as with all action cameras, it does have its own pros and cons. Laser beam on a cam – When you turn on the laser targeting mode from the menu, a 1mw laser beam is emitted three seconds after pressing the camera snapshot or video recording button. This laser indicates the center of your frame, which is a pretty nifty feature. Various recording activation options – You can use the remote control and snap pictures from a distance, activate recording via VOX voice, or simply use the cam’s buttons manually. The remote control, which operates up to 6-feet (2 meters) away, is bulky enough with large buttons to be used even with gloves on. Waterproof housing – No rugged cam can compete in the market if it can’t be used underwater. The Swann FreeStyle HD meets Ingress Protection Rating IP68 with a rating for use 25m (65ft) underwater. Mounts and other accessories included in the kit – The standard kit comes with several mounts, including a helmet mounting bracket, two flat adhesive mounting pads, an L-shaped mounting bracket, curved mounting pad, a connector tray bracket and wrist strap. The joiners and bolts included in the mounting system allow users to manipulate angles and height of your Swann Freestyle HD. Additional accessories, such as the head strap mount, chest harness mount, vented helmet and helmet side mount, car auto charger, vehicle suction mount, rechargeable lithium battery, surfing mount pad and bicycle handlebar mount are also available individually at the Swann store. If you have GoPro mounts and attachments, you’ll be pleased that they are compatible with the Swann Freestyle HD. 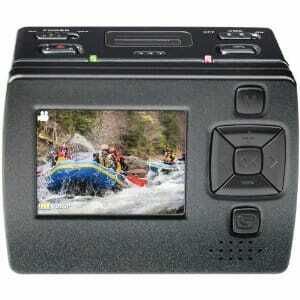 Removable Color LCD monitor – This is a massive plus for this camera. GoPro has it’s own detachable LCD screen built it’s sold separately. With this Swann Freestyle here you get it included with the basic package for the one price. Detachable screens are great to keep the bulk weight off your camera when you’re recording and only attach it when you want to see instant replays. Limited audio and control with housing – Your cam will be protected underwater and from rugged or wet conditions when you put the housing on, but there’s no option to turn on or turn off the camera. The only available buttons are for video recording and photo snapshots. In addition, your video’s sound quality will be reduced significantly when the Swann Freestyle HD is enclosed. No LCD screen with housing – Aside from the limitations of the Swann Freestyle when housed in the polycarbonate case, you also can’t incorporate the 1.5″ LCD screen inside the camera, which makes it hard to adjust preferences, see what’s in your shot or play back footage. The Swann FreeStyle HD 1080p Action Camera provides high quality video and sound, decent still photos (in well lit areas), offers plenty of accessories in the basic kit such as a water-proof housing all packaged together for a low price. This is one of the cheapest HD action cameras on the market! It’s actually $60 less than the GoPro Hero 2. Admittedly, there are limitations when the housing is attached, which will be a turnoff for some, especially if you’re adventures involve under water and wet conditions, but for everything else, you’ve got a gadget that can compete with the best of them. Because the Swann Freestyle 1080p HD action camera is a minor camera, it’s not sold at every store online or offline. I do recommend if you want to buy it, you shop online for a number of reasons. To buy online will usually save you a significant amount of money. The most visited and trusted online store I can recommend to you is Amazon.com. They constantly have the best range of products and lowest prices. You can always buy with assurance at Amazon. Thanks for reading my review and I hope you were able to learn a few more things about the Swann Freestyle action camera to help you make a better decision about buying one. Personally, with the $90 discount, it’s one of the best deals you’ll find for a camera of this spec. Of course, you are encouraged to read other reviews to learn as much as you can but if you’re thinking about buying it, I say go for it.